With the US Employment data and the holiday weekend approaching in the US, I have decided to close my open orders in AUD/USD. It’s another frustrating trade idea as we were right with direction, but too conservative on entry as our orders to go long at .9500 were missed by a mere 15 pips. Hello! Just a quick update as our orders still remain open. AUD/USD continued to fall today starting in the Asian session after the RBA kept rates at 7.25% and further throughout the Euro/US overlap on positive US data surprise. The market is consolidating now, so probably no action for the rest of the day and I will continue to keep my orders open at .9500. Stay tuned for future updates and adjustments! Good morning all of you Forex junkies! Time to take another stab at AUD/USD as it appears we may be getting a retracement today on positive US data released earlier. Fundamentally, the Aussie’s huge positive interest rate differential and strong commodity correlation continues to make it more attractive than the Greenback. Unless we see Asia’s demand of Australian commodities dwindle (which probably won’t happen in the short term), the market may continue to price the pair to parity. We do have plenty of Australian event risk as we have retail sales, housing, and trade balance data coming out throughout this week, along with the RBA interest rate decision tomorrow. Speculation is that the RBA will hold at 7.25%, even with rising inflation, as global growth continues to slow. In the US, it’s Jobs data time and with the underlying trend of job losses in the US, it doesn’t look good for the Greenback. If our trade is triggered and we do hit our first profit target, look for an update to add a trailing stop to hopefully catch a run higher. Good luck and good trading! On a side note…Don’t forget to check out Freshpips.com! 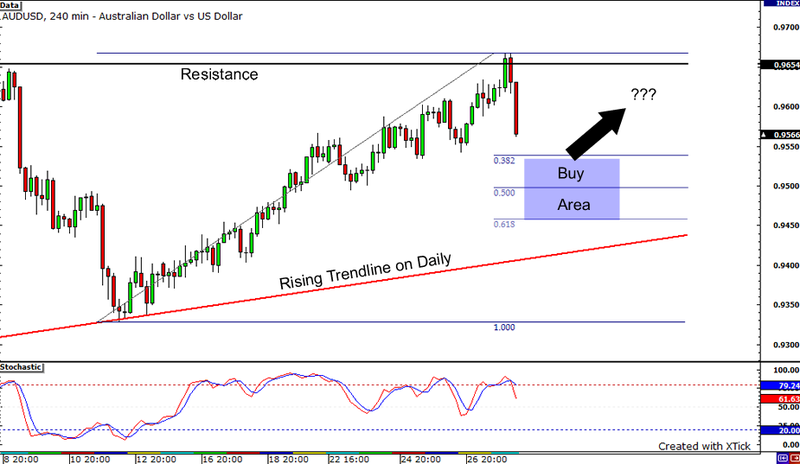 Forex news picked by Forex traders! Let’s help each other out find what moves the markets…See ya there!